The Transonic Pro Heavy Duty Pest Repeller is ideal for bat control. 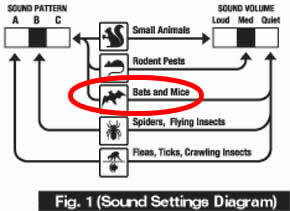 Select the Bat and Mice setting and plug it in. The ultrasonic sound environment is intolerable to bats. Bats are repelled away from the Transonic Pro unit because they cannot adapt to the constantly changing array of ultrasonic and sonic signals emitted by this device. Bats hunt after dark and roost during the day. Their eyesight is not very acute and they navigate using echolocation. For this reason, ultrasonic bat repellent devices are the most simple and effective way to get rid of bats. Bats send out high-frequency noises that, by means of an echo, are returned to the bat’s ears, letting them know the distance, direction, and size of the space or object(s) in front of them. This is called echolocation. It is the reason why bats are extremely sensitive to sounds in this frequency range. Ultrasonic bat repellent devices help get rid of bats by emitting sound waves that interfere with echolocation, making the affected area inhospitable to bats. Independent laboratory and university testing has proven ultrasonic and sonic sound technologies to be effective forms of bat deterrents. This low-profile electronic bat repelleruses sonic (audible) and ultra-sonic (silent-to-humans) sound waves that bats hate. The Transonic's intense, variable pitch sound waves effectively repels rodents. This noisy, hostile, dynamic sound environment is intolerable to bats and other rodent pests, yet friendly to non-rodent pets, humans and the environment. Bats are repelled away from the Transonic Pro unit because they cannot adapt to the constantly changing array of ultrasonic and sonic signals emitted by this device. The unit disrupts their habitat, effecting their sleep and communication habits, forcing them to leave the area. No traps or poisons, the Transonic Pro Heavy Duty Repeller is a humane cost-effective, easy solution to your bat problem. It drives them away with sounds they can't stand! This unit is a versatile ultrasonic/sonic bat repeller. 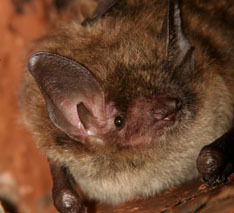 In some areas, bats are protected by conservation laws. All of our ultrasonic bat repellent devices are safe and humane. Ultrasonic sound waves are natural bat deterrents and do not cause harm. The bat colony will seek a new roost in unprotected structures or natural areas.